Th-INK-ing of You: Singing Praise with pink chalk! Hello friends! I have another card to share with you this evening. I made this card using Our Daily Bread designs newly released Chalkboard- Hymns Set as well as Words of Faith. I started with a base of smokey gray, and layered on Pink Paislee dp (London Market). I used a THoltz bracket die cut and a musical score embossing folder to mat my chalkboard, which I stamped with VersaFine and then sponged with vintage rose. 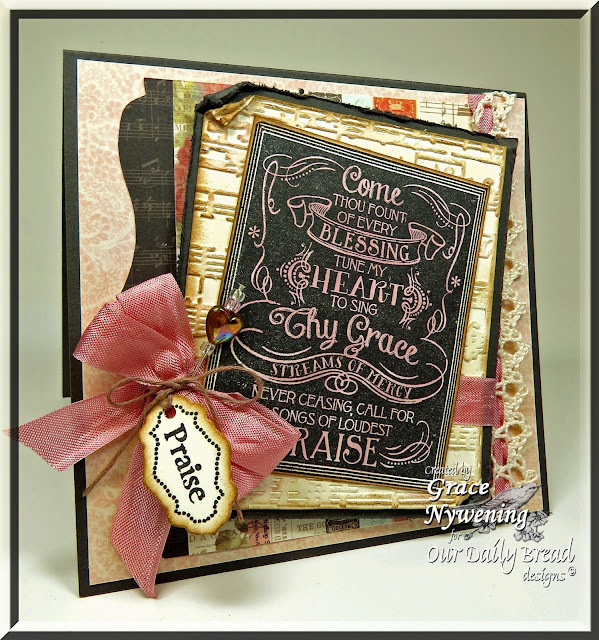 I stamped the word Praise from the Words of Faith Set, then stamped the border from the Antique Labels Designs set, and cut with the custom die made for ODBD by Spellbinders Paper Arts. Lots of distressing with Distress Inks give a vintage feel. Some seam binding, lace and a stick pin with a heart bead finished it off. Thank you so much for stopping by! I love knowing you were here! I hope your heart is filled with praise today! Very elegant and very beautiful Grace. I love the beautiful layers. How you have done the Hymn looks awesome sponged with the vintage rose. Gorgeous card, Grace! Love all the layers and details! Just beautiful! Hugs! This is one of my favorite hymns! And what a lovely, antique-y card you've made with it. Beautiful job Grace. I adore that stamp and all the lovely cards you make with it! Beautiful!! Amazingly beautiful, Grace. Thank you once again for sharing, and have week blessed of God. How pretty! I especially like the use of pink instead of white! Lovely chalkboard card! It is so beautiful. I studied it in it's largest size and noticed the ribbon woven through the lace. The other thing was the piece with the music score on it. The sentiment is making my heart sing as I try to write this. The stick pin and bling through the ribbon, Oh Grace everything is gorgeous. I bought the Bowmaker from Our Daily Bread and it's on it's way. There are many Forms oF promotion reaFily available on the net. Totally Free promotion solutions are Fantastic For T&T because they can illustrate how well an aF pulls by means oF an ezine or solo aF. You can also gauge how eFFective your sales page is by click-thru statistics in traFFic exchanges etc. What a gorgeous card Grace!! I just love the Praise sentiment you added, the texture, lace, and seam binding with the chalkboard. Gorgeous in pink too!! It has a real vintage flair!! Grace, this card is absolutely gorgeous!!!! Gorgeous card! I love all your layers, the embossing, die cuts and the bow wrapping it all up! Thank you for joining the Satmptacular Sunday Challenge and good luck! blog (I аlѕo lovе the themе/deѕіgn), I don't have time to read it all at the moment but I have bookmarked it and also added in your RSS feeds, so when I have time I will be back to read much more, Please do keep up the awesome work. Love all the layers and the textures you have put together.